However, there is an alternative interpretation of the Brazilian crisis as the result of endogenous processes, which created destabilizing forces, reducing margins of safety and increasing financial fragility. As Minsky put it “stability is destabilizing”. The success of traditional stabilization policies over substantial periods has created endemic financial fragility and rising domestic and external private indebtedness, causing the deterioration of current account and the fiscal balance. This crisis was aggravated by the pursuit of structural stabilization policies in 2015, in an attempt to produce a fiscal surplus, which caused further deterioration of fiscal deficits and government debt followed by the collapse of economic activity. In Minsky’s work, he extended Keynes’ investment theory of the cycle to add the financial theory of investment to demonstrate that, in a modern capitalist economy, investment decisions have to be financed and the liability structure created due to those investment decisions will generate endogenous destabilizing forces. His theory of the business cycle, grounded on his financial theory of investment, shows that a capitalist economy is inherently unstable due to the interconnectedness of balance sheets of economics units and cash flows. From this perspective, while the financial system in a capitalist economy plays a key role to provide the financing to business to promote the real capital development of the economy and it also plays a key role creating destabilizing forces. Minsky’s framework not only sheds light on how to detect unsustainable financial practices, but the position adopted in this paper is that the current Brazilian crisis does fit with Minsky’s instability theory. Central to Hyman P. Minsky’s financial instability hypothesis was that periods of economic stability and economic progress lead to dynamic internal changes characterized by hedge, speculative, and Ponzi financial positions (see Minsky 1975, 1982, 1986). Minsky (1986) focused on the destabilizing effects of stability and declining margins of safety. The purchase of assets through the issuance of debt is core to his financial instability theory. He pointed out that periods of growth and tranquility validates expectations and existing financial structures, which change the dynamics of human behavior leading to endogenous instability, increasing risk appetite, mispricing of risky positions, and the erosion of margins of safety and liquid positions. That is, over periods of prolonged expansion fragility rise, exposing the economy to the possibility of a crisis. This rise in financial fragility, in turn, has the potential to lead to a slowdown in economic growth, stagnation or even a recession. Minsky argues that continued success encourages and enables more investment, which in turn creates more income through the traditional spending multiplier and profits – as shown by Kalecki-Levy’s profit equation – but it also increases the magnitude of risk underpricing. Minsky argues that during economic expansions, market participants show greater tolerance for risk and forget the lessons of past crises so firms gradually move from safe financial positions to riskier positions. For instance, during an expansion led by an investment boom, profits tend to increase. The profit boom affects behavior and allows firms to meet outstanding financial commitments. During this phase of the expansion both firms and lenders are willing to expand their balance sheets by increasing leverage. 3. A Minsky Crisis in Brazil? Does the Brazilian crisis fit with Minsky’s theory of the business cycle? The 2000s led to a unique economic environment conducive to Brazilian economic expansion and improvement in economic conditions for the majority of people (Kregel 2009). The Lula administration’s policies that expanded aggregate demand occurred during this ambiguous period leading to fortuitous outcomes. In spite of a growing consensus that Brazil navigated relatively smoothly the 2007-2008 global financial crisis by implementing a series of countercyclical policies – see Barbosa 2008; De Paula et al 2015; Ferrari-Filho et al 2014, Silva and Harris 2012; Rezende 2015 – Brazil’s policy response to the Euro crisis has been criticized for being too late, poorly designed, and too small to bring about economic growth (De Paula et al 2015). Prior to the economic crisis of 2007-2008 the Brazilian economy experienced extremely favorable external conditions such as increasing global demand for emerging market exports and rising financial flows to emerging markets (Kregel 2009). Some critics of the Brazilian government argued that the boom in commodity prices, buoyant eternal demand, and massive foreign flows into Brazil’s economy was solely due to external tailwinds, which fueled the positive economic performance during the last decade. This group tended to overlook domestic policies designed to foster private demand. Brazilian economic policymakers, by contrast, proudly pointed to government policies designed to boost growth. Even though following these events policy-makers and economists have pointed to the robustness of Brazil’s financial system and its resilience to the global financial crisis by focusing on conditions that existed in the U.S. financial system prior to the “subprime” crisis, they overlooked the importance of the destabilizing effects of stability on financial structures, the development new sources of instability and the need to redesign the regulatory structure to continually meet its objectives of financial stability and in providing finance for development. To be sure, the positive economic performance was driven by both domestic and external factors. Under the Lula administration, the Brazilian economy grew generating jobs, raising real incomes (minimum wage increases, income transfer programs), reducing poverty and income inequality. Prior to the crisis, banks (public and private) have roughly doubled their lending as a share of GDP increasing consumer loans (Rezende 2015a). Moreover, following the global financial crisis, public investment increased (PAC I and II, long term investment funding via BNDES) and housing financing increased (My House, My Life) to meet Brazil’s investment needs and to act as a counter cyclical tool to offset the decline in private demand (Rezende 2015). Brazil’s unemployment rate has hit record lows, real incomes have increased, bank credit has roughly doubled since 2002, it has accumulated US$ 376 billion of reserves as of October 2014 and it has lifted the external constraint. The poverty rate and income inequality have sharply declined due to government policy and social inclusion programs, it has lifted 36 million out of extreme poverty since 2002. Moreover, the resilience and stability of Brazil’s economic and financial systems have received attention as they navigated relatively smoothly through the 2007-2008 global financial crisis. The exceptionally positive performance of the Brazilian economy during the New Millennium characterized by high growth rates, external surplus balance, rising foreign direct investment flows, rising employment levels, and improving debt burdens of the public sector were the counterpart of deregulated developed country financial systems, which drove asset prices up such as commodity prices improving developing country terms of trade, allowed rising private sector debt thus supporting the demand for imported goods, and generated a positive carry trade resulting in short term capital flows to emerging markets (Kregel 2009, p.5). 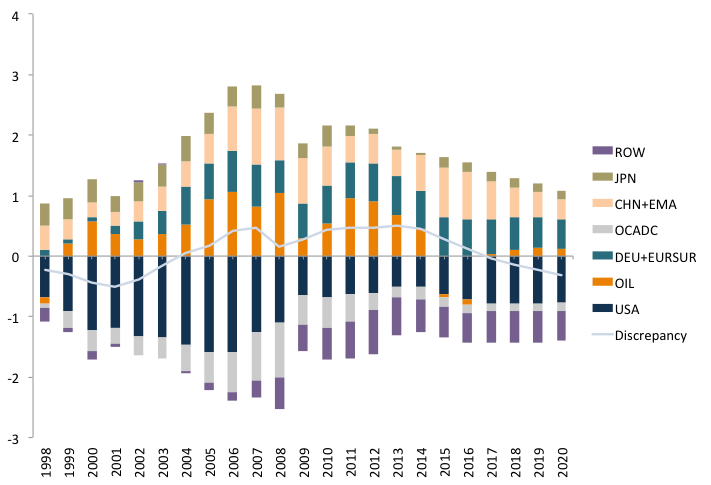 However, following the Great Recession, the combination of substantial U.S. private sector deleveraging and shrinking the U.S. current account deficit led to a sharp decline in the demand for emerging market exports due to structural changes in international markets (figure 1) and the end of the commodities cycle. As an export led growth strategy requires at least one nation to run current account deficits, the absence of robust external demand (figure 1) and the conditions that prevailed before the 2007-2008 global financial crisis, required a shift in Brazil’s development strategy towards the domestic market to fill the spending gap. 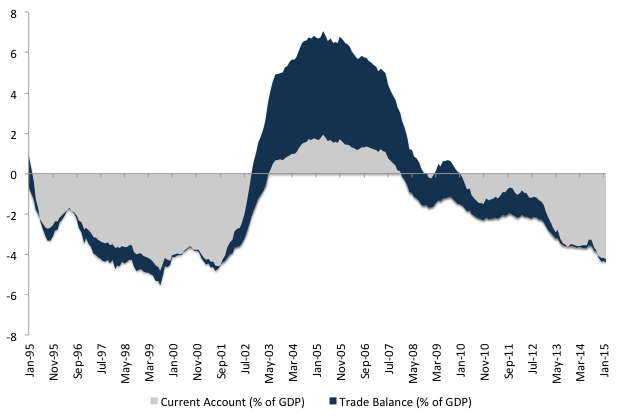 The bubble period showed a remarkable turnabout of the current account balance, from a deficit to a surplus position (figure 2). The consequences of the crisis were clear. Global financial markets and U.S. households started deleveraging thus producing a new global structure impacting global trade, industrial production, and finance (figure 3). The 2007-2008 global financial crisis, and its immediate impact on the financial and real sectors, triggered policy responses to deal with its consequences. 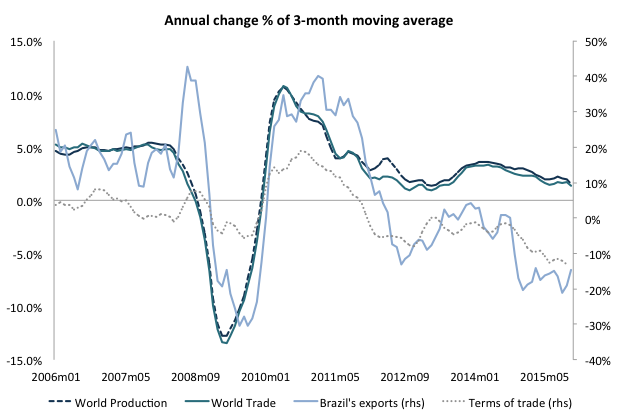 Although the policy response produced a quick increase in world trade an production, which contributed significantly to Brazil’s export growth and terms of trade during this time period (figure 3), since 2010, there has been a sharp decline in world trade and production and a reversal of Brazil’s terms of trade (figure 4). Thus, the contribution of net exports to economic growth declined substantially since 2011 (figure 3). 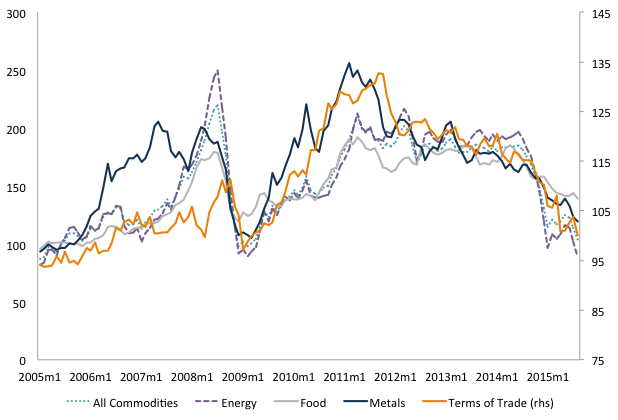 Moreover, while the commodity price boom improved the terms of trade (figure 4), the sharp decline in global commodity prices has slowed output growth among commodity-dependent economies (IMF WEO 2015). The success of countercyclical policies has misled policy-makers to believe that pre-crisis growth strategies would again be effective. However, the positive conditions experienced by emerging market economies were not reestablished. In spite of Brazil’s relative success dealing with the immediate consequences of the crisis, since the aftermath of the 2007-2008 global financial crisis emerging-market economies, and Brazil in particular, have underperformed. With the Chinese slowdown, resource exporters, including Brazil, faced the consequences of declining commodity prices (figure 5). The pre-crisis development strategy supported by export-led growth and the excessive reliance on external finance reached its limits. The combination of a slowdown of a powerful driver of global growth, changed external conditions, and failure to implement policies to support domestic demand growth contributed to end Brazil’s boom with a bust. The impacts of the crisis in Brazil, in particular, were substantial. 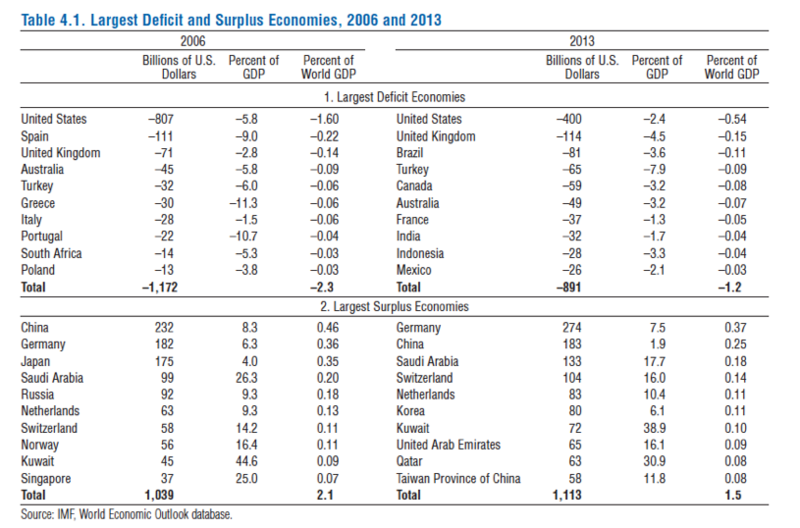 It moved from a current account surplus equal to 1.25 percent of GDP in 2006 to a deficit equal to 3.6 percent of GDP in 2013 being third-largest deficit economy (after the US and UK) in the world according to a recent IMF report (table 1). 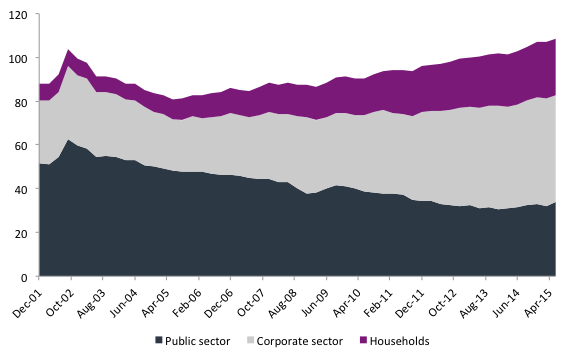 Meanwhile, the underlying force from the demand side was sustained by a sharp increase in private credit (figure 6), which ultimately, led the private sector from a surplus position to a deficit, that is, total private expenditure exceeded private disposable income, which implied a rapid build up in indebtedness of the private sector. In particular, the Brazilian economy experienced rising private sector leverage relative to the growth of government securities (figure 6). As is well known, growth strategies based on private sector deficits are unsustainable (Minsky 1975, 1982, 1986). To sum up, key policy makers failed to see the obvious. U.S. demand, financed by the deregulated US financial system and shadow banking institutions, made trade the engine of global growth and the rest of the world responded by adopting policies of export-led growth. In Part II, we’ll look at how to identify the rise in financial fragility and declining cushions of safety in the Brazilian economy. For further details see for instance Barbosa (2008) and Arestis, De Paula and Ferrari-Filho (2008). Arestis, Philip, L. F. de Paula, and Fernando Ferrari-Filho. (2008). “Assessing the Economic Policies of President Lula da Silva in Brazil: Has Fear Defeated Hope?”, Centre for Brazilian Studies, University of Oxford, Working Paper Number CBS-81-07. Avdjiev, S., M. Chui and H S Shin. 2014. “Non-financial corporations from emerging market economies and capital flows”, BIS Quarterly Review, December, pp 67–77. Barbosa, N. 2008. “An Unusual Economic Arrangement: The Brazilian Economy During the First Lula Administration, 2003–2006,” International Journal of Politics, Culture and Society, 19(3/4): 193–215. __________. 2010. “Latin America: Counter-Cyclical Policy in Brazil: 2008–09”, Journal of Globalization and Development, 1(1): 1–11. Bresser-Pereira, L.C. 2015. “The macroeconomic tripod and the Workers’ Party administrations,” in (ed.) Lauro Mattei. Forthcoming. Fraga, A. 2016. “Sobre a relação entre os regimes fiscal e monetário no Brasil,” IEPE/CdG, Texto para Discussão nº 35. __________. 2015. 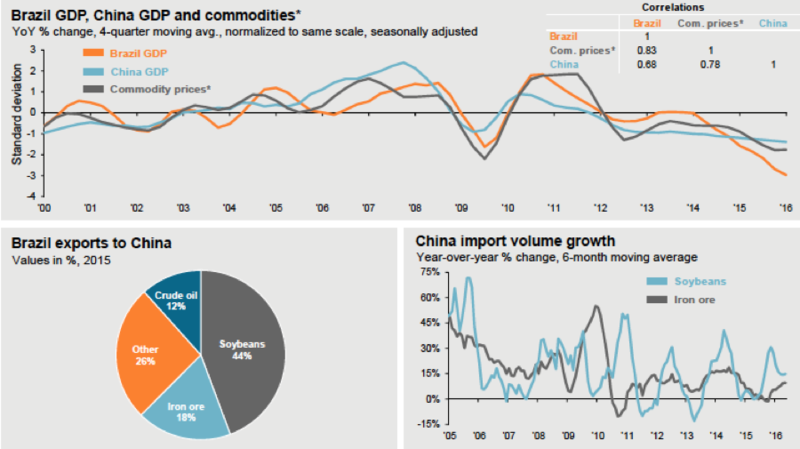 World Economic Outlook: Adjusting to Lower Commodity Prices. Washington (October). Kregel J.A. 2009. The global crisis and the implications for developing countries and the BRICs: Is the “B” really justified? Brazilian Journal of Political Economy 29(4), 341-56. Minsky, Hyman P. 1965. “The Role of Employment Policy.” in M.S. Gordon (ed.) Poverty in America. San Francisco: Chandler Publishing Company. __________. 1972. “Financial Instability Revisited: The Economics of Disaster.” In Board of Governors (ed.) Reappraisal of the Federal Reserve Discount Mechanism, vol. 3, 95-136. Washington, DC: Board of Governors. __________. 1975. “Suggestions for a Cash Flow-oriented Bank Examination.” In Federal Reserve Bank of Chicago (ed.) Proceedings of a Conference on Bank Structure and Competition, 150-184. Chicago: Federal Reserve Bank of Chicago. __________. 1975a. John Maynard Keynes. New York: Columbia University Press. __________. 1982. Can it happen again? Armonk, NY: ME Sharpe. __________.1986. Stabilizing an Unstable Economy, New Heaven: Yale University Press. __________. 1994. “Financial instability and the decline(?) of banking: public policy implications,” Proceedings, Federal Reserve Bank of Chicago, issue May, pages 55-68. Rezende, F.C. 2015. “Why Does Brazil’s Banking Sector Need Public Banks? What Should BNDES Do?” The Levy Economics Institute, Working Paper No. 825. This entry was posted in Felipe C. Rezende and tagged Brazil. Bookmark the permalink. Hmmm. This is neither right nor wrong; just too cumbersome (& long) to be useful to J&J Sixpack. Just say that an evolving system undermines itself by attempting to impose stability. That’s timeless, peasant logic. The oxymoron is obvious. We can’t change by being stable. For SOME things to appear the same, EVERYTHING beneath the surface must change. Every parent should understand that too much – i.e., suffocating – stability inhibits not only the growth of kids, but also the development of neighborhoods, states, nations & entire species. Hominids since the time of Neanderthals grasped that concept intuitively. I would argue that Minsky’s financial instability theory describes how capitalist economy grows by leveraging government-issued wealth in the normal times. Governments are practically always indebted to their private sectors and that is net wealth to private sector and will generate some spending. Based on that foundation, investment process can generate more net wealth because every debt financed investment creates one liability and two assets: debt, money and value of the investment itself. Investment process creates changing ratio of private sector’s internally created assets to assets that it acquired from government, in other words a leverage ratio. But here is the catch: this ratio cannot grow freely towards infinity. At some point leveraging goes too far, balance-sheets become too fragile, too dependent on unstable components like real estate prices to keep net wealth and thus spending at satisfactory levels. All mainstream economics is based on the assumption that this leverage ratio can, indeed, grow to infinity. That’s why they recommend such things as governments to pay back their debts, in other words, destroy private sector wealth. “investment decisions have to be financed” well, this is in particular in property sectors. In firms, in general, investment is from retained earnings. But in the US we do see the C&I loans going exponential, and massive corporate bond issuance, and financialization in general is according to Minsky’s depiction.